“Oh my, your soap is incredible! I feel the energy just walking by, and smelling the beautiful clean scent?! Heaven! The products are infused with Reiki energy. 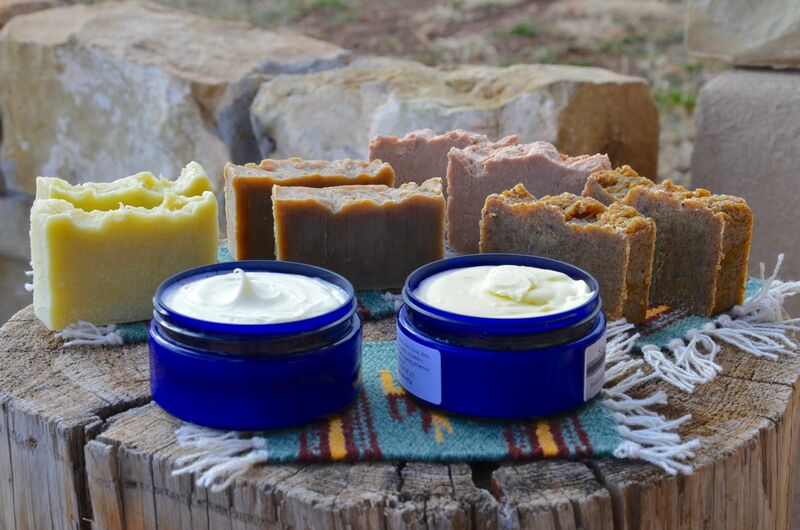 All of the butters & oils are organic or wild harvested, no chemicals or preservatives added. The essential oils are pure, organic or wild harvested, steam distilled, and no petrochemicals added. I can create an oil blend that will meet your specific needs and then add the blend to your body butter. My skin is sensitive and I had spent many years trying to find soaps and shampoos that didn't bother my skin & scalp. I wanted a product without harmful chemical ingredients. Finally out of frustration after having bought another expensive soap that didn't work, I decided to create my own body products. 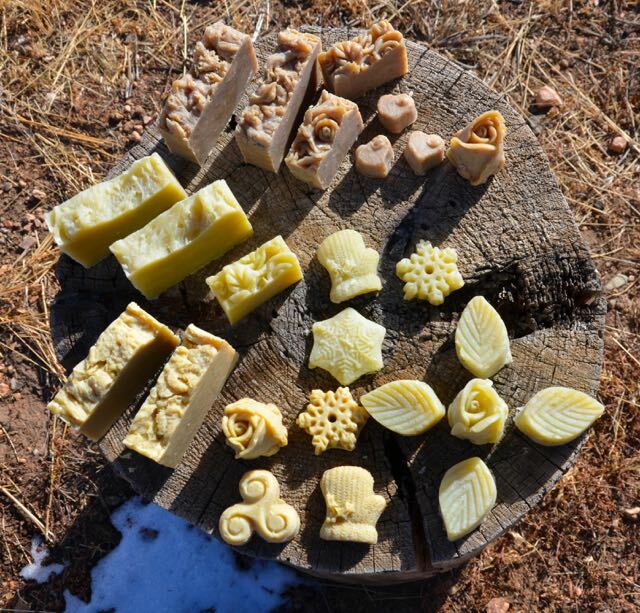 I researched and read everything and began to make my own soaps and body butters. After I made my first batch of soap I danced around like a silly little kid! I was so excited - no skin issues!!! When we're in Colorado we live at 7,400 feet and it's DRY! 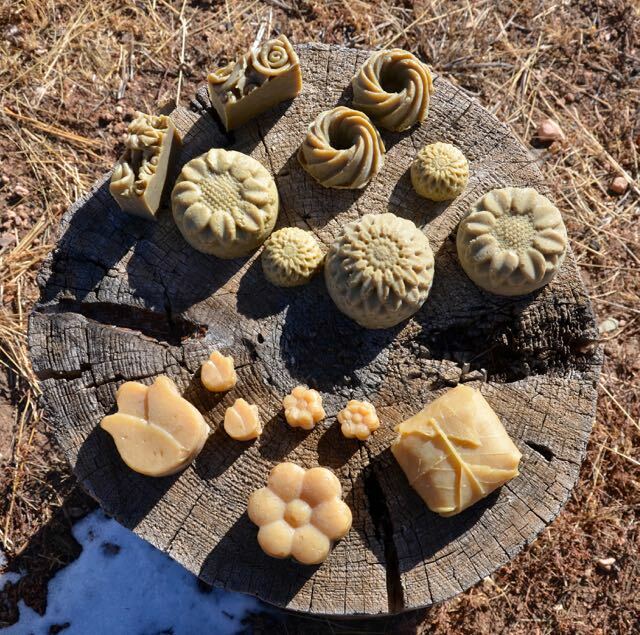 Even though my soaps are nourishing - the high elevation and dry climate is not. After I made my first body butter all I could say was "Oh my!" It was luscious!!! I had used my soaps as shampoo for a couple of years - when someone had asked me about shampoo bars. I researched herbs and oils that have extra nourishment for the hair and scalp - and created 2 shampoo bars. I wanted to make one more conditioning and one more cleansing. Ingredients: Organic or wild harvested butters: aloe, cocoa, shea, mango, avocado; arrow root; oils: argan, jojoba, vitamin e, apricot seed, meadowfoam, rosehip seed, sea buckthorn & pumpkin seed. Ingredients: Organic or wild harvested butters: shea, cocoa, aloe, mango, avocado; arrow root; oils: babassu, argan, jojoba, vitamin e, apricot seed, meadowfoam, pumpkin seed, squalane & pomegranate. For sizes and weights scroll down to the end. Sizes Available (for measurements see below): Large bar, Large Folded Leaf bar, Travel / guest size bar with rose & leaf tops, Single rose bud, sample size leaf, Seasonal shapes - limited availability - mitten & snowflakes. Sizes Available (for measurements see below): Large bars, Travel / guest size bars with rose & leaf tops, Single rose bud, sample sizes = leaves, small pumpkin shapes, Seasonal shapes - limited availability - mitten & snowflakes. Marshmallow & Coconut Cream: Organic & Wild Harvested ~ coconut milk; mountain spring water infused with lavender flowers, marshmallow root, comfrey, nettle, burdock, violet leaf, Irish moss, golden seal, yarrow, yucca & pau d’ arco; saponified butters: kokum, cocoa, shea; saponified oils: coconut, babassu, olive, jojoba, avocado, castor; beeswax; unsaponified jojoba oil. Simply Gentle: Organic & Wild harvested ~ saponified olive oil, castor bean oil & meadowfoam see oil. Simply Gentle with Lavender: Organic & Wild harvested ~ saponified olive oil, castor bean oil & meadowfoam seed oil; organic lavender essential oil from France. Simply Gentle Lavender Infusion: Organic & Wild harvested ~ saponified olive oil, castor bean oil & meadowfoam seed oil; Lavender flower infusion; lavender essential oil. Each Large Bar is approximately 4.3 oz and measures 3.5" x 2" x 1"
Small Travel Guest size bar topped with Roses & Leaves is between 1.8 & 2.2 oz and measures 2" x 1.5" x 1"
Folded Leaves: each bar is approximately 3.6 oz and measures 2.5' x 2.5' x 1"
Leaves small sample / guest size: average 1oz and measure approximately 1.25" x 2" x .75"
Distilled water & herbal infusion of nettle, comfrey marshmallow root, burdock root, lavender flowers, violet leaf, Irish moss, yarrow, yucca, goldenseal leaf, sandalwood bark, pau d’ arco, flax seed, chia seeds, horse tail; saponified oils of: olive, avocado, castor, shea, hemp: unsaponified argan oil; panthenol, silk amino acids & oat protein. Sizes Available: Big sunflowers, Chrysanthemums, Folded leaf bars, Travel / guest size bar with rose & leaves on top, sample sunflower & chrysanthemum sizes. This bar is excellent for all hair types but specifically for normal to dry hair / scalp. Large Bar / Sunflower or Chrysanthemum is approximately 4.3 oz, and measures 2.5" x 2.5" x 1"
Rose Leaf Design Top / Guest Size / Travel Bar is approximately 1.8 & 2.2 oz and measures 2" x 1.5" x 1"
Sample size flowers are approximately .7 oz and measure 1.25" x 1"
This bar is excellent for all hair types but specifically for normal to oily hair / scalp. Large Bar / Tulip is approximately 2.2 - 2.4 oz and measures approximately 2.5" x 2" x 1"
Rose / Leaf Design Top / Guest Size / Travel Bar is approximately 1.8 & 2.2 oz and measures 2" x 1.5" x 1"
If this is your first time for using a soap / shampoo bar - it may work right off the bat for you. Then again – you may need to try a few things to get the results you desire. Consider this a scientific experiment. Most hair types need an apple cider vinegar rinse after shampooing - especially if you have hard water as the minerals coat the hair. Try infusing your apple cider rinse with herbs or essential oils. Shampoo Bar directions: Start by getting your hair wet, rub the shampoo bar all over your head, lather, then rinse well. For long hair – no need to soap the bottom – as you rinse your scalp, the soap will rinse down to the lower tresses. After you towel off, apply the “hair rinse” & rub it on the hair & scalp. The smell does dissipate & you won’t smell like ACV for long. If after trying this for a couple of days your hair doesn't feel the way you would like it to; you may need to “rinse” the apple cider vinegar off while in the shower. Or you may not need an apple cider vinegar rinse! You can add 5-10 drops of essential oils of your choice. (If you will be rinsing this off don’t add the essential oils – their healing properties will just be rinsed down the drain. Save them for after the shower & rub them onto the scalp or add it to argan / jojoba oil and rub in. Mix this all up in a glass jar and then funnel it to a spray bottle - if you've added herbs sometimes the herb particles will clog the spray nozzle. If your hair needs to be rinsed afterward funnel it into a squirt bottle.